Chess is getting a sequel. Yes, that Chess. The game with the little horses and kings and queens has been around for thousands of years. A few video games have transcended our hobby to become household names, but even they have nothing on Chess. They're footnotes in a gaming history that spans generations, cultures, and continents. Chess is no footnote. Chess has been here for ages. So Chess is, like, the ultimate game, right? Why would anyone make a sequel to that? Chess 2 is a new video game that's coming out on Steam this week. At first glance it looks like regular old musty-dusty Chess, but the sequel to the hit classic from between 280 and 550 CE adds multiple factions, a bidding mechanic, and a whole new way to win. All of this is necessary because Chess is far from perfect, insists MIT graduate and longtime game designer David Sirlin, who created Chess 2. He brainstormed up the game a few years ago and posted the rules online for free, but now a digital version has released on Steam. So, what drove a person to rebuild Chess, to (maybe) make it stronger? The answer is... Street Fighter, weirdly enough. "I was working on [the balance of] Street Fighter HD Remix many years ago and also going to lots of Street Fighter tournaments," he explained to me over the phone. "I was just kinda thinking a lot about the different types of games, how chess is kind of on one end of the spectrum and poker's on the far opposite end in terms of how much leeway you have to out-guess your opponent. In chess it's super rigid and very much about memorization and patterns. In poker there's a lot of reading of what you think is going on in people's minds." Street Fighter, though? What does that have to do with anything? "At Street Fighter tournaments I encountered something that stood out to me as really great," Sirlin said. "I was watching John Choi, a champion player. In one match he played in a way that really reminded me a lot of chess. He was using a fireball pattern to keep out his opponent, and he was reacting. It was almost turn-based. He was eliminating as many guesses as possible, because that pattern is really hard to guess." "In another match he was taking all these crazy risks. It was like he was in the other guy's pattern, so he needed to break the game open to find some way to create guessing situations. So there's a chance he could guess right." That was exciting, Sirlin enthused, and it made him realize that a lot of things about Chess, well, aren't. This stems in part from the fact that Chess is, as Sirlin put it, a game of "perfect information." Everything is on the board. There is no randomness. Nothing your opponent can hide. In theory if you know the right patterns, you can get past anything. Unlike checkers, the game isn't completely, mathematically solved yet, but aspects of it are. Openings, endings. When circumstances are constrained, it's very possible to succeed if you play by the book—or maybe multi-story library, given the number of possible variables. "Any game that has perfect information—no randomness, no hidden information—becomes more and more about memorization and less about improvisation," Sirlin explained. "Two grandmasters in chess, Bobby Fischer and Capablanka, complained about this. They really like the improvisation—where you understand fundamentals of the game and use intuition to make clever choices. That's what they like. That's what I like. I think that's what anyone would like versus, 'Well, here's this solved endgame. You've just got to follow through.'" Some Chess variants, like Bobby Fischer's Chess960, have attempted to solve this by randomizing elements of the game, but they only delay pattern-based memorization. They don't, er, solve the problem of solutions. That's where two of Chess 2's three pillars—bidding and multiple factions—come in. The bidding system is meant to simulate two pieces dueling, with each player secretly wagering up to two stones on the outcome of an encounter. If the defender outbids the attacker, both pieces go to itsy bitsy immaculately carved heaven. This allows for a mind game, an element of deception and surprise. In practice it can be a bit over-complex (there are "taxes" for weaker pieces taking on stronger pieces, etc. ), but the strategic possibilities are undeniably enticing. "You want to bait your opponent into spending the maximum number of stones," chuckles Sirlin, "and then you just bid nothing because it wasn't actually important. Pretend something worthless was the most important thing on the board." Factions, however, are what really turn the game on its head. Armies are no longer necessarily equal. Sure, there's the classic faction, which plays just like a regular chess set, but Chess 2 also includes five other factions with their own abilities and personalities. Sirlin's goal here was to bring improvisation back into the game, to create different dynamics between different armies that force people to think on their toes. Or fingertips, I guess, since most people don't play chess with their toes. "All the Chess 2 armies are of the form, 'It's like regular Chess, except with these two [new] things.' So the classic army is just like regular Chess. There. Easy. Then there's Empowered, where the bishop, knight, and rook share each other's powers when they're next to each other. I just explained it in one sentence, and now you can play Empowered." "That's a good one because there's so little to explain, but it's so inspiring. You just immediately start thinking of tricks you can do with that setup." Other armies, like Nemesis, get a little trickier. The Nemesis army's pawns and queen move in constant pursuit of the opponent's king. Pawns can even move diagonally as long as they're running down the crown. And then there are super off-kilter factions like Animals, who shatter Chess' usual glasses-pushing contemplation with bestial fury. Tigers leap, elephants can rampage multiple spaces forward, right through friend and foe alike. It, um, takes some getting used to. "The Animal one is the most different, with multiple pieces that are different, but that was on purpose," said Sirlin. "Each time there's a game with characters—multiple sides to choose from—it's good to have one of them be really simple and for one of them to have a few more things to learn. Others can be really complex for people who want to really dig in." "No big problems emerged balance-wise, but we haven't had that many players," Sirlin said. "We'll see." Smart players know when the jig is up. At that point they don't fight for glory and honor. They fight for a draw. Sirlin was surprised when he found out just how prevalent this was. "The percentage of draws among Chess experts has gone up and up and up over the years," said Sirlin. "It's a very steady increase that's reached over 62 percent of matches. That's super high. Higher than any other competitive game played anywhere else in the world, as far as I know." People maneuver their pieces so that their opponent can't come crashing through, leaving the board looking like a late-season Game of Thrones episode. They get their king incontrovertibly out of harm's way, and that's game over. But again, that's not particularly interesting. Not for players or spectators. Enter Chess 2's midline invasion rule. It states that, if either person's king reaches the middle of the board, it's game over: that player wins. And according to Sirlin, it fixes a whole mess of problems. "If [slippery slope] is starting up, just end the game," he said.That's what the midline invasion rule does. If I get a little bit ahead, we don't have to play any further. At that point you're just not gonna be able to stop my king from crossing the midline, once we get down to so few pieces. "So we don't need that stalemate rule anymore. We'll just let you move into check and die or whatever. We don't need a draw enabling rule for that to occur. And it probably won't occur because you have so few pieces that the midline thing is likely to happen." 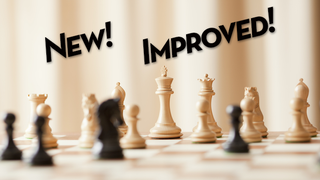 Like Chess 2's other changes, midline invasion also enables more strategic possibilities, more room for improvisation. Players can make sneaky midline plays from the get-go, pretending to play normally but actually parting the black and white seas for their kings to cross without getting taken out. At this point in the conversation, I decided to roll with an assumption I was basically certain had to be true: Sirlin consulted grandmasters about this, right? Chess greats? Augmented his own design savvy with their mind-boggling expertise? Actually, no. "I didn't make any effort to contact Chess professionals," Sirlin said, noting that he did dig into chess history and adapt rules from some variants, but on his own terms. "When I show game designs on my site or forums, I have a whole bunch of players from all over the world who play all sorts of different games who are interested and try it out. "They break it," Sirlin said, "they show what's wrong with it, and give feedback. They have really different views on things. Some are super mathematical. Some aren't even good at the games, but they're good at rules consistency issues. Others want it to feel right—flavorful and fun." Of course, this isn't totally revolutionary. Chess has had countless variations over the years, but a radically different game that tears open the musty rulebook and rips out its most maggot-eaten pages could make some real waves—especially with Steam's massive user base backing it—in Chess clubs, in classrooms, around the world. The combined appeal of Chess and video games, theoretically, could reach places neither could conquer on their own. Sirlin, though, just set out to make a game—past and future of chess be damned. "It's honestly not something I spend a lot of time thinking about because I have my head so much in the design part," he admitted. "It would be great, sure. It would be incredible if it could be even five percent or one percent as prominent as chess has been, that would be amazing. "But I haven't taken steps to make that happen. I'm not talking to any sort of Chess Board. I'm not soliciting chess masters or marketing to them. I'm just a guy making a game here. So it's gonna have to be a community thing—enough natural interest that it starts to build on itself and maybe become a new alternative [to regular chess]." Isn't that all kinda... blasphemous, though? Or at least, disrespectful of the culture surrounding chess, the people who love this game, whose brains have mutated pulsating, thrumming chess cortexes to contain all their knowledge? Maybe, but Sirlin thinks that's one of the reasons he was able to make so many (relatively speaking) huge changes to Chess' basic formula. To him, nothing was sacred. "Forebodingly, since this happened before I made Chess 2, I heard Richard Garfield, the creator of Magic The Gathering, say he thought a Chess variant is the ultimate no-man's land of game design. The thing no one wants. His reasoning is that there are two kinds of people it could appeal to. One is Chess players, but they'd hate it no matter what, even if it were a hundred times better, because it's not Chess. That's unfair, but game players can be super biased. It's really hard to change anything, ever. "The other audience would be people who are not chess players. And Garfield thought those people wouldn't want to play a Chess variant because it just sounds boring. "So of course I tried it," he laughed. Sirlin claimed, however, that despite all his focus on Chess' flaws at a high level, non-chess players are some of the people who enjoy his game the most. "We've had a lot of success with non Chess players," he said. "Or they played Chess a couple times, but they just play video games now. But Chess 2 is like Chess with modern design principles. People are used to games having a lot of different sides now, like in Street Fighter or StarCraft or something. This game makes more sense to them." Some people will always disapprove if you tamper with a holy grail, but Sirlin tries not to let that get to him. This, he told me, goes back to his days working on Street Fighter, when he "ruined" Cammy by making her better—making her attacks more powerful and better balanced. Thing is, her identity among many players arose from her being, er, kinda terrible. Sometimes, though, you've just got to press on and hope people eventually come around to what you're doing, why you think things need to change. "I just thought about Chess as a barebones system," Sirlin said. "Maybe if I thought too much about cultural significance, I would have been too afraid to make Chess 2." Sirlin acknowledged that plenty of people would cite this change or that change and criticize his game by saying it's "not Chess." "But you know, exactly," he said, "That's why I didn't call it that. I called it Chess 2."